BPI Best Creatine Review – Should you take it? Do you load up on creatine for your workouts? Creatine supplements have been around since the early 90s, and it has quickly become a necessity for the gym community. Despite what you may have heard, creatine does not increase the size and strength of your muscles on its own; however, it would be an essential supplement that would help you get the results that you want with proper diet and exercise. BPI Sports is known to brand their products as “best”. Other products released by BPI Sports are Best BCAA and Best Protein and next on the list is their Best Creatine supplement. BPI Sports has made it possible to stack their brand supplements to create a one-stop shop for your bodybuilding supplement needs. There’s no doubt that creatine is essential to increase your performance, but is BPI Best Creatine the best muscle building supplement out there? Let’s find out. The manufacturers of creatine supplements are always coming up with schemes to help sell their products faster. One of the best known practices in taking creatine is through a loading phase, where you take 20 grams of creatine divided into 5-gram servings taken in a 5-7 day period. After which, you’re free to take 5-gram servings of creatine each day. This loading phase of creatine is believed to increase creatine saturation, which helps in endurance and strength. However, recent studies show that creatine loading doesn’t drastically change your saturation or performance, and you’re free to take creatine pre, post, and pretty much any time you like as long as you take 5 grams a day. Who uses BPI Best Creatine? Majority of the users of BPI Best creatine are those who have bought in to the BPI Sports stack, which pretty much gives them majority of their bodybuilding supplement needs. Creatine has become such a necessity to improve workout performance and pump that it’s simply just as important as protein powders to ensure that you’re getting the most out of your workout. What strikes me the most about BPI Best Creatine is its taste. It’s not too sweet or too overpowering like the other creatine supplements. Its Icy Blue Razz flavor is best taken with a cold shake, and it mixes well. Just expect a few sediments, but that’s nothing a couple more shakes can’t fix. The creatine profile of BPI Best Creatine composes of several types of creatine, so you’re not just confined to the mono. 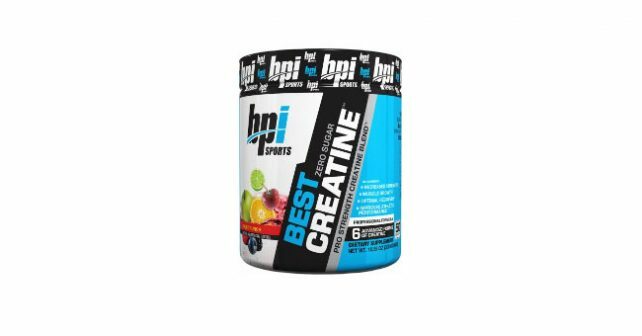 BPI Best Creatine contains a 4 gram proprietary blend of Creatine Monohydrate, Creatine Anhydrous, Creatine Magnapower, Creatine Phosphate, Creatine AKG, and Creatine Alkaline. The proprietary blend also includes 500mg Betaine Anhydrous and 50mg Himalayan Pink Salt. Considering its creatine profile and flavor, it appears that BPI Best Creatine is focused more on taking creatine which is known to upset the stomach. Creatine supplements are also not that popular when it comes to taste, so having a great-tasting creatine mix is a big plus for BPI Best Creatine. My only concern with BPI Best Creatine is its creatine content. Its 4-gram proprietary mix contains only 3.5 grams of creatine (approx.). The daily recommended intake for creatine is 5 grams, and you simply can’t do a plus-minus dosage on creatine. Therefore, you may not be getting the best dose of creatine in BPI Best Creatine, but you’d still get an awesome energy boost during workouts, and you wouldn’t have any problems taking a dose of BPI Best Creatine down. As with other BPI Sports products, BPI Best Creatine is a solid creatine supplement, which can easily contend for the best muscle building supplement on the market. If you’re finicky about your creatine content, then you should opt for other creatine products which contain 5 grams of creatine per serving. If you find that supplements upset your stomach often, then BPI Best Creatine is the right creatine supplement for you. Since BPI Best Creatine only contains creatine and no other stimulants, it gives you the opportunity to stack it with the best supplements for muscle gain. The best supplement to stack with BPI Best Creatine is NitroGenix 365, given its strength and recovery boosters that speed up muscle growth. If you’re looking for the best muscle building stack, check out BPI Best Creatine and NitroGenix 365.